The Arizona Diamondbacks improved their overall record to 4-4 and are back at .500 for the season. They came into their first home stand of the season at 2-3 as they took on the Cincinnati Reds in their 3 game series. If nothing else, the Diamondbacks are showing some heart early on this season, and they won their first series at home by beating the Reds 2 games to 1. 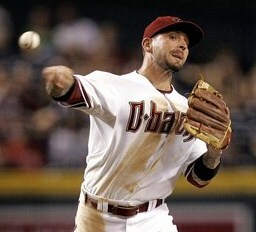 In game one of the series, the Diamondbacks dominated early and exploded in the 8th inning to win 13-2. Ian Kennedy threw eight innings, giving up only one run to secure his first win of the season. Two doubles in the bottom of the first inning led to a Diamondbacks 2-0 lead. Miguel Montero doubled in the second, and scored on a wild pitch by Cincinnati pitcher Travis Wood to make it 3-0 after two innings. With 3 walks and another double, this time by Xavier Nady, the Diamondbacks extended their lead to 6-1 when they scored 3 in the bottom of the 6th inning. A home run by Justin Upton in the 7th inning gave the Diamondbacks a 7-1 lead, and in the 8th inning Arizona almost doubled their score. Leading off with another double by Xavier Nady, Miguel Montero followed up with his second double of the game. This was followed by a walk, single, and home runs by Kelly Johnson and Chris Young, and by the end of this inning, the game was all but over. The score was 13-1 going into the top of the 9th. A home run by Joey Votto gave the Reds their second run of the game, but that was all they could muster, and the Diamondbacks were back at .500 with a 3-3 record. In game two, the Cincinnati Reds were leading 2-1 over the Arizona Diamondbacks in the top of the 7th inning. The Diamondbacks, up to that point, had out-hit the Reds 8 to 2, but were only able to push one run across home. After giving up 2 hits, 2 walks and 2 runs in the top of the first inning, Daniel Hudson only allowed 1 more hit and only walked 1 batter over the next 7 innings. By the top of the 9th inning, the score was still 2-1 with the Reds leading. The Diamondbacks brought in Juan Gutierrez to try and keep the game close. Instead, the Reds scored 4 runs on a walk, 3 singles, a double, and two throwing errors by Arizona. The score was now 6-1 Reds going into the bottom of the 9th inning, and that’s the way the game ended. 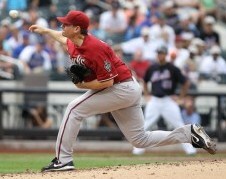 The Diamondbacks left 18 runners on base and blew a good outing by starting pitcher Daniel Hudson. They fell back below .500, but had the rubber match game left to play against the Reds on Sunday. The Diamondbacks were down 0-5 by the top of the 3rd inning in game three, and things were not looking good in their attempt to win the series. 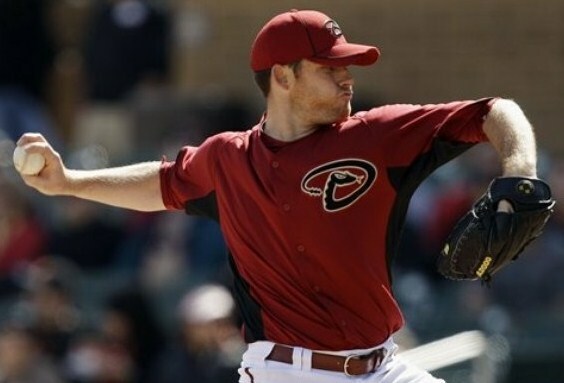 Stephen Drew doubled to score Willie Bloomquist in the bottom of the third to give the Diamondbacks their first run. Still trailing 1-5, the Diamondbacks led off the bottom of the 5th inning with 4 straight singles, followed by a 3-run home run by Ryan Roberts. By the end of the 5th inning, the Diamondbacks had taken the lead 6-5. The lead did not last, however, as Johnny Gomez hit a 2-run homer in the top of the 7th off of Aaron Heilman, giving the Reds a 7-6 lead. The Diamondbacks batters walked 3 times in the 7th inning, but could not score, and still trailed going into the 8th inning. Pinch hitter Gerardo Parra singled to start a rally in the bottom of the 8th. That was followed by a walk and another single, scoring Parra. With two outs, Chris Young hit the second 3-run home run of the game to give the Diamondbacks a 10-7 lead going into the top of the 9th inning. Closer JJ Putz was brought in to finish the game. After scoring a run to make the score 10-8, the Reds had runners on first and second with only one out. Putz ended up striking out the next two batters for his third save of the season. The Diamondbacks won 10-8, won the series 2 games to 1, and were back at .500 with a 4-4 record. The bats are hot early on for the Diamondbacks, as six of the regular starters have a batting average over .300. Miguel Montero was 4 for 7 (.571), Stephen Drew was 6 for 12 (.500), Willie Bloomquist was 5 for 10 (.500), Xavier Nady was 2 for 4 (.500), Justin Upton was 5 for 12 (.417), and Russell Branyan was 2 for 5 (.400) in the series against the Reds. Next up for the Diamondbacks, a three game home series against Albert Pujols and the St. Louis Cardinals (3-6), who are off to a slow start. ~ by Troy Erickson Realtor on April 12, 2011.